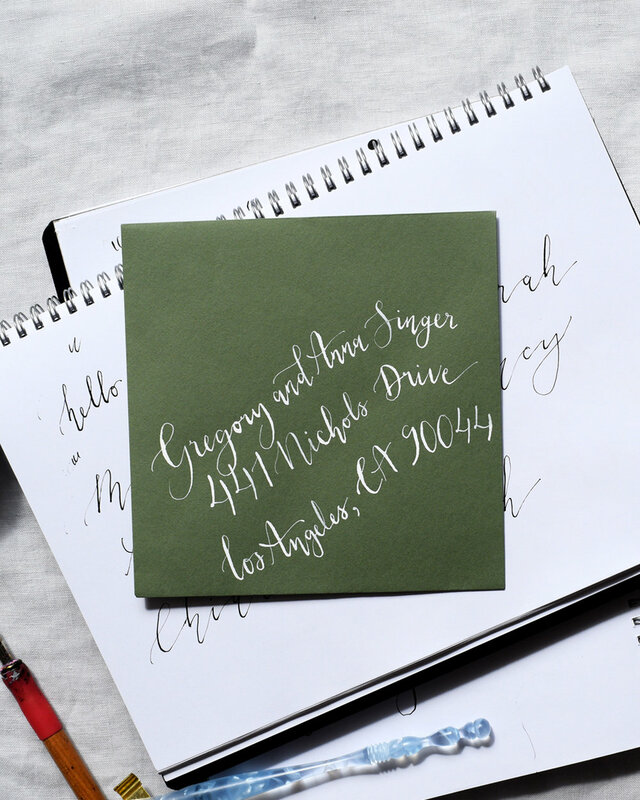 I’d been thinking about learning calligraphy for a year, pretty much since I started my stationery business. I always hated my handwriting, and actually writing for or in front of people filled me with anxiety for reasons I cannot explain which obviously only made my writing worse! About 7 months ago during my time in Los Angeles, I bought a set of calligraphy nibs with a holder from Blick and was practicing on standard print paper (with a downloadable practice sheet from The Postman’s Knock which is a great learning resource). I didn’t really get anywhere, because I hadn’t done the proper research into which inks, nibs, nib holders, and paper would work best and so quickly gave up because I thought I’d never be good at at. When I returned to London I decided to give it another go, so I quickly found those sheets again and printed them out. This time I’d done a bit more research into the type of calligraphy I wanted to do and the best equipment to do it with. I read a lot of blogs and found that the Zebra G nib was supposed to be great for beginners, so I bought quite a few of these and absolutely loved them! The strokes had so much more variation and they were so much more flexible than my starter kit from Blick. Further to this, I bought some plain art paper (not quite calligraphy paper but a lot smoother and thicker than printer paper), a Kuretake Pen Nib Holder, and some Daler-Rowney black india ink to start. I quickly became addicted to learning and honing this new skill, practicing between 1-3 hours per day for the first few weeks. Now I’m a few months in and although far from perfect, I’m confident in my writing. I’ve had such lovely feedback on Instagram where I opened a competition for modern calligraphy place cards for a future bride, and have had great advice from calligraphers and stationers whenever I’ve struggled with inks or nibs which I’m so so grateful for. I've added a few more supplies such as the Brause 66EF nib to write with metallic inks, of which my favourite is the Winsor & Newton Calligraphy Gold. I also love the Winsor and Newton drawing inks and am on the look out for a nib that works with the really sparkly gold! My next steps are to learn more about spacing and writing on different types of paper so that I can start adding this to my portfolio of skills and do calligraphy addressing for my couples, as well as learning different styles of modern and classic calligraphy. If you're interested in learning calligraphy, make sure to invest in some good ink, nibs, and paper to make it easier on yourself. Mastering calligraphy will always require hours and hours of practice, but with the right equipment you'll find putting in the necessary time much more enjoyable and rewarding!